Studio Line: Columbia TriStar - The Crew's Here. The Camera's Are Rolling. And the Directors Got a Problem! Married movie stars Gwen (Catherine Zeta-Jones) and Eddie (John Cusack) are Hollywood's favorite couple, on-screen and off. But when their very public romance turns into a very private breakup, only their veteran press agent (Billy Crystal) and their assistant Kiki (Julia Roberts) can help them show some love while they promote their last film together, all while keeping the media away from the real story! But Kiki's got a whole new problem when she finds herself falling in love with the last person she ever expected in this hilarious and irresistable comedy! Box Office: Budget: $48 million. Opening Weekend: $30.181 million (3011 screens). Domestic Gross: $93.607 million. DVD: Widescreen 2.35:1/16x9, standard 1.33:1; audio English Dolby Digital 5.1 & Dolby Surround 2.0; French Dolby Surround; subtitles English, French; closed-captioned; single sided - double layered; 28 chapters; rated PG-13; 103 min. ; $27.96; street date 11/13/01. Supplements: Deleted Scenes With Director’s Introductions; Theatrical Trailers; Filmographies; Production Notes. Has the movie-going public finally started to lose its collective affection for Julia Roberts? Probably not, but based on the results of her 2001 releases, the answer remains in doubt. Earlier this year, she matched with Brad Pitt for a marquee pairing from heaven, but the gross came from somewhere south of there; The Mexican took home a modest $66 million, which was chickenfeed for something with such apparent box office juice. Despite the presence of many notable costars, Julia’s summer release, America’s Sweethearts, didn’t do much better. It snared a fairly mediocre $93.6 million, which currently places it 16th on the chart of the year’s top grossers, and puts it between a couple of sleeper successes, Legally Blonde and Cats & Dogs. Neither of those set the world on fire, but they surpassed most expectations, whereas Sweethearts fell short of hopes. I thought a Julia Roberts movie in which she makes a cheese sandwich would earn at least $100 million, but 2001 has proven me wrong. Sweethearts also received fairly mixed reviews, and those thoughts largely mirrored my own. At best, the film offered a fairly cute and entertaining experience, but only occasionally did it threaten to become something more compelling. 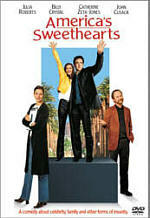 As it starts, Sweethearts introduces us to Lee Phillips (Billy Crystal), a recently fired movie studio publicity guy. When his ex-boss Dave Kingman (Stanley Tucci) discovers that the new extravaganza from reclusive directorial genius Hal Weidmann (Christopher Walken) won’t be shown to anyone until an upcoming press junket, he begs Lee to return to the job to save the potentially-disastrous day. The lack of preview is only one minor aspect of Kingman’s concern. More important is the fact that the film in question - called Time Over Time - is the apparently-final pairing of “America’s sweethearts”, the very successful romantic pair of Gwen Harrison (Catherine Zeta-Jones) and Eddie Thomas (John Cusack) whose dual film career ended along with their marriage. Gwen dropped Eddie to hook up with Latin heartthrob Hector (Hank Azaria), which sent Eddie around the bend; for quite some time, he’s been holed up at a retreat to solve his mental problems. Lee finagles a way to get them both together, and it’s up to him and Gwen’s assistant - and sister - Kiki (Julia Roberts) to make sure all works out well for the amassed members of the press. Lee attempts to orchestrate many different ways to distract the critics from the fact the studio has no film to offer, while Kiki encounters her own problems. The formerly tubby lady has her own thing for Eddie, and this seems to develop while Eddie deals with his issues related to Gwen. It all leads through a variety of comic machinations. Shallow Gwen doesn’t really seem to care with whom she ends up, as long as it’s good for her career, and Eddie’s so hung up on Gwen that he can’t fully comprehend the reality of his situation with Kiki. Lee just wants to make the weekend work so he can regain his old job. At its best, Sweethearts has some very entertaining moments. Virtually all of these revolve around the film’s modest skewering of its own industry. Sweethearts opens with a funny reel of Gwen and Eddie’s “greatest hits”, all of which are uniformly terrible, in a stereotypical way. From there we find a running roster of industry-oriented gags, many of which hit their mark. The actors definitely help make the material work. Back in the Eighties, I thought Crystal was a decent performer, but after the success of City Slickers, he became too big for his britches and provided work that consisted mostly of insipid mugging. However, he comes through fairly well in Sweethearts, as he avoids most of his cutesy tendencies; Lee is a minor shark, but he’s endearing despite his maneuverings. Cusack is usually charming and entertaining, and he seems good here as well, though I didn’t think he stood out among the crowd. Zeta-Jones was more of a surprise, as she appeared to feel unafraid to make Gwen a rather unpleasant character. Oh, her insecurities ensure that we don’t actively dislike her; if anything we felt sorry for her, since she’s so clearly an emotional mess. Still, Zeta-Jones doesn’t hesitate to create a comically selfish and self-absorbed persona who adds perverse life to the piece. Sweethearts adds a solid supporting cast with excellent actors like Tucci, Walken, Azaria, Seth Green and Alan Arkin. As for Roberts, she seems acceptable but unspectacular in the part. I think this was partly because she’s not as solid when stuck in a supporting role. Sweethearts doesn’t really feature a lead role. At the start, it looks like Lee will be the main character, but none of the four potential leads ever grabs the story and takes control. This doesn’t appear to affect three of them, but it diminishes Roberts’ presence and makes her feel vaguely bland and lost in the mix. The general drabness of some parts of Sweethearts is what makes it fairly ordinary as a whole. The first half of the flick works pretty well, mainly because it concentrates most of its time on the movie industry comedy. During the second half, however, Sweethearts focuses more on the love triangle - or rectangle, if we include Hector - and that’s where it loses its bearings. I won’t reveal the ending because it could be seen as a spoiler. But let’s put it this way: I wasn’t exactly shocked with the way it went. It’s that essential predictability that left me flat, and there also seemed to be little chemistry among the stars. Frankly, I didn’t really care if Eddie got back with Gwen or if he connected with Kiki. The comic shenanigans that surrounded the press junket and the movie presentation were much more compelling, and the love story seemed uninteresting. Unfortunately, the film largely lost sight of Lee and his ilk during the second half, as we’re stuck mostly with Eddie and Kiki. Despite those boring elements, America’s Sweethearts never totally went off track. At its best, it provided a reasonably amusing and entertaining mockery of the film industry. This wasn’t wicked satire ala something like The Player, but it seemed funny and compelling nonetheless. However, the flick started to peter out during its second half, which meant that as a whole, it was a decent but unspectacular offering. America’s Sweethearts appears in both an aspect ratio of approximately 2.35:1 and in a fullscreen version on this single-sided, double-layered DVD; the widescreen image has been enhanced for 16X9 televisions. Only the widescreen picture was reviewed for this article. Though not flawless, the image consistently looked quite good. Sharpness always came across as crisp and distinctive. At no time did I discern any soft or fuzzy visuals, as the movie consistently presented a detailed and accurate picture. No moiré effects or jagged edges resulted, but I did detect a smidgen of light edge enhancement at times. In regard to print flaws, I saw a speck or two of grit, but that was all. Otherwise, the movie seemed clean and fresh at all times. Sweethearts used a natural but broad palette, and the colors came across as wonderfully vivid and bold. Though the production didn’t provide any hyperactive hues, the tones we saw looked very clear and distinct, and they always seemed quite vivacious; I was really impressed by the movie’s color reproduction. Black levels also came across as deep and dense, while shadow detail appeared appropriately heavy but not overly thick. Overall, this was a fine transfer that missed out on “reference” standards mainly due to a little edge enhancement. Though decent in its own right, the Dolby Digital 5.1 soundtrack of America’s Sweethearts was much less impressive. The soundfield itself hued closely to the standard forward-oriented comedy mix. Most of the audio remained in the front channels, where it provided a reasonably solid presentation. Music showed very nice breadth and clean stereo separation, while ambient effects cropped up in the right and left speakers with appropriate frequency and activity. Those elements meshed together well and created a relatively lively and involving spectrum. Surround usage generally tended toward reinforcement of effects and music, and the rears did so well. They didn’t overwhelm the forward spectrum, but they added life and depth to the track. On a few occasions, I heard some split-surround usage; during a movie screening, the sound of the projector popped up in the rear right speaker, and a helicopter also flew clearly from back to front. Nonetheless, this remained a pretty subdued track for the most part. Audio quality was decent but erratic. At times speech seemed surprisingly rough and edgy, and dialogue also occasionally came across as somewhat flat and muddy. The lines remained intelligible, but they didn’t sound very good, and the rough quality of the production audio made looped lines seem that much more obvious and prominent. Other than the dialogue, however, the soundtrack appeared positive. Music was nicely bright and showed good fidelity, with acceptably bright highs and reasonable depth. Effects functioned in a similar light. Most of these elements were pretty gentle, as the movie didn’t offer a slam-bang experience. However, they usually appeared accurate and clean, and they could demonstrate solid dynamics at times. For instance, a motorcycle rumbled richly, and the other aspects were good as well. In the end, the soundtrack of America’s Sweethearts had some flaws, but it seemed acceptable for the most part. Earlier I noted that Legally Blonde and Cats & Dogs currently surround America’s Sweethearts on the list of 2001 movie grosses. Those movies both provided nice DVD special editions, so one might expect similar treatment for Sweethearts. However, one will be disappointed, for Sweethearts definitely skimps on extras. The DVD’s only significant supplement is a minor collection of Deleted Scenes. We find five different clips, each of which runs between 45 seconds and 90 seconds for a total of five minutes, 25 seconds worth of footage. To my modest surprise, these snippets were generally pretty good. The first one - which extends a shot of Hector in a bathtub - was best, but all seemed amusing and interesting. To let us know why this good material didn’t make the cut, the clips can be screened with or without introductions from director Joe Ross. (The DVD itself refers to these as “commentary”, but no audio from Roth appears during the snippets; only opening video can be found.) Roth’s intros last between 50 seconds and 66 seconds for a total of five minutes of information. He provides good discussions of the shots and clearly lets us know why the pieces failed to make the cut. Note that if watched on their own, the deleted scenes are enhanced for 16X9 TVs. However, if you select the director’s intros, the program reverts to non-anamorphic video. The sound seems the same in either case. A few minor pieces round out the DVD. We find Filmographies for director Joe Roth and actors Julia Roberts, John Cusack, Billy Crystal, Catherine Zeta-Jones, and Hank Azaria, as well as brief “Production Notes” within the DVD’s booklet. Lastly, we get trailers for Sweethearts as well as Roberts’ My Best Friend’s Wedding and Zeta-Jones’ The Mask of Zorro. Overall, the deleted scenes were good, but this was a surprisingly bland release in regard to its extras. Since America’s Sweethearts disappointed at the box office, I suppose it makes sense the DVD would be lackluster as well. The movie provided intermittent fun and was pretty entertaining when it gently poked fun at the film industry, but it seemed less compelling as a romance. The DVD featured solid picture with decent sound plus almost no significant supplements. Overall, the movie might make for a good date flick, but the unspectacular DVD isn’t something I can recommend for purchase.